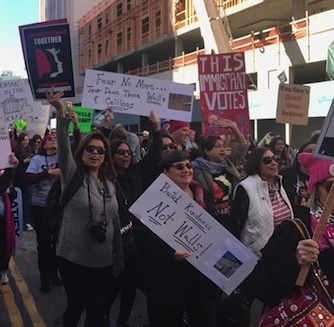 Hundreds of thousands of people took to the streets of downtown Los Angeles and across the nation this past Saturday, as the second annual Women’s March looked to convert anger at President Donald Trump’s policies into victories in this year’s elections. The coordinated rallies in L.A., Washington, D.C., Chicago, New York, Santa Ana, Palm Springs and other cities also aimed to repeat the success of last year’s demonstrations, where an estimated 3 to 4 million took to the streets to protest Trump’s inauguration. As was the case last year, the march saw a wide variety of priorities being advocated, including women’s rights, environmental protection, access to health care, criminal justice reform, voting rights, immigrant and LGBTQ rights. Saturday’s march took place just hours after the Congress, unable to reach a compromise on the federal budget, plunged the country into a three-day government shutdown, causing uncertainty among federal workers and services dependent of federal revenue. Democrats had vowed to block approval of a continuing resolution to temporarily fund the government unless it contained a fix for DACA, something members of both parties and the president had professed to want. Members on both sides of the aisle had been working to negotiate a new DACA deal to protect from deportation undocumented immigrants who were brought to America as children, but the talks stalled and a three-day federal government shut down ensued. For many at Saturday’s Women’s March, the plight of Dreamers, as the young DACA recipients are often called, was of equal importance to other issues highlighted at the event. Linda Castaneda Serra of Los Angeles said she is the daughter of immigrants from El Salvador who are now facing deportation following the president’s revoking of TPS for “refugees like her parents. “I was born here and will turn 18 in May, and you can believe I will vote, and I will get everyone I know to vote,” she said, sharing her views on Facebook and Twitter. Meanwhile, negotiations continued in Washington D.C. throughout the weekend and a deal, without a fix for DACA, was reached Monday to restart the government and keep it going for three more weeks. GOP leaders promised they would bring DACA up for a vote, a promise that now appears to be far from a done deal as the president continues to vacillate on what he wants, failing to give clear direction to his party on what a DACA policy should look like. From the streets to the main stage in front of City Hall, marchers lamented actions coming out of the Trump Administration and society in general. Organizers had predicted at least 200,000 this year, but Los Angeles Mayor Eric Garcetti Tweeted after the event “600,000 strong,” while the Los Angeles Sheriff’s Department put the crowd at 300,000. Garcetti told the crowd at City Hall the official estimate was 500,000 people, which he said would make it the largest march in the country. 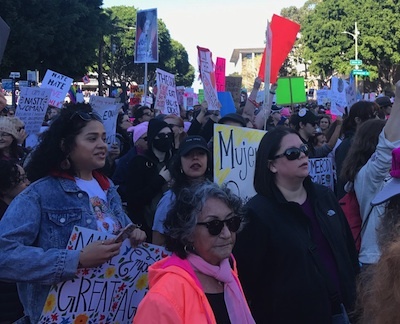 Last year’s L.A. march was also the largest (organizers said about 750,000 people attended in 2017, although fire officials estimated the crowd at about 350,000). Many of the event’s early speakers did not directly address Trump’s policies but rather the MeToo movement that has resulted in dozens of famous and powerful men accused of sexual assault or sexual harassmentFederal shutdown after The New York Times and The New Yorker in October published details of alleged assaults and harassment by Hollywood movie producer Harvey Weinstein. But due to Trump himself being accused of multiple sexual harassment incidents along with bragging on tape about sexually assaulting women — which helped inspire the first Women’s March — the connection to Trump was apparent. Actresses Natalie Portman, Olivia Munn, and Viola Davis were among the early lineup of speakers who took the stage, with other politicians, activists and celebrities scheduled to speak until 4 p.m.
“Let’s declare loud and clear, this is what I want, this is what I need, this is what I desire …,” Portman said. Police had advised attendees to leave backpacks and other bulky items at home and minimize the materials that they take with them. The march is the first large public event to be held since the City Council enacted a new set of rules last October on what is allowed at a public event where First Amendment rights are expressed. Anyone in violation can first receive a warning from a police officer before being cited or arrested. How many women did Harvey Weinstein victimize? When did he start down the continuum leading from Hollywood’s shamefully tolerated “casting couch” overtures to increasingly flagrant sexual harassment, and finally (if we believe his accusers, as I think we should) open sexual assault? We’ll probably never know. But one thing we do know: There was a first time, a Victim Zero. While neither that victim nor the others should be blamed for what happened to them, it’s worth asking why there followed a Victim One, and a Victim Two, and so forth, spanning decades, before Weinstein was finally brought low for his depredations. And why so many others remain in the shadows, sexually victimizing women and men, adults and children, with impunity. We need a culture change. The current culture of planting seeds of fear – the “stranger danger” mentality and such – before victimization and offering sympathy after clearly isn’t getting the job done. Instead of #MeToo after the fact pageantry, this problem calls for the inculcation of a strong, affirmative #NotMe attitude – an unwillingness to be Victim Zero, or to remain silent as other victims inevitably follow. What must be rooted out is the sickness in our culture that lets sexual predators leverage fear into opportunity to commit their crimes and shame into an ability to hide those crimes. It has to start with parents and extend to friends, mentors and communities. Our children need to be brought up to understand that there’s nothing they can’t bring to the rest of us, and that we will back them completely should they encounter someone who attempts to victimize them. We have to shift the fear away from would-be victims and strike it into the hearts of would-be victimizers. We have to make it preemptively clear that we will always ostracize those who harass and punish those who assault, not those who are harassed or assaulted. We must send our young people out into the world understanding that when they walk away from – or, if necessary, run away from or defend themselves against – a Harvey Weinstein, it will be Weinstein, not them, who pays the price. And while systems of criminal justice must and should presume innocence and work diligently to establish the truth, victims must know, to their very core, that they enjoy a starting presumption of belief from the rest of us. The goal is simple, but this is a war. As Carl von Clausewitz pointed out, “everything in war is simple, but the simplest thing is difficult.” It’s not going to be easy. But I believe we can prevail, for ourselves and for our loved ones. Let’s make a better world, a world in which our Harvey Weinsteins become outcasts, not billionaires.